A step-by-step guide to understanding and using the AIR CRE Contracts and Addenda written by contracts experts who create, review, update and provide training for all of the AIR CRE Contracts. The manuals explain, paragraph-by-paragraph each of the AIR CRE Contracts and related addenda to serve as a reference guide for readers. 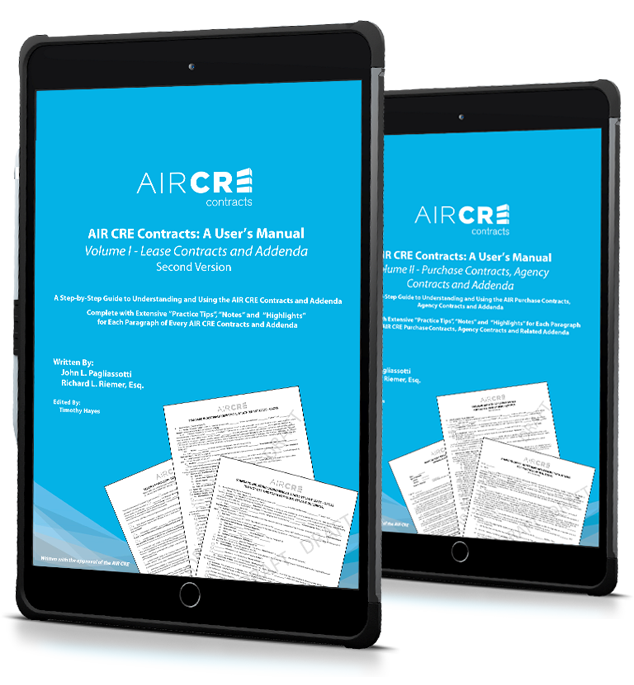 The AIR CRE Contracts Manuals provide both a legal and transactional perspective of the AIR CRE Contracts offering concrete ideas that can be applied to your next real estate transaction. These manuals will help you add value to the negotiation process and achieve better results for you and your clients. If you use the AIR CRE Contracts or represent clients who do, the AIR CRE Contracts Manuals are a must! The purpose of this user’s manual is to explain, paragraph-by-paragraph each of the AIR CRE’s Purchase Contracts and related addenda as well as all listing contracts and related addenda to serve as a reference guide for readers. The manual is designed to be a guide for brokers, attorneys, landlords, tenants and property managers who are interested in fully understanding the various contracts published by the AIR CRE. It is a tool designed to assist users in more effectively using, understanding and negotiating the AIR CRE’s Contracts. at a special discounted package price. A step-by-step guide to understanding and using the AIR CRE Contracts and Addenda written by contracts experts who create, review, update and provide training for all of the AIR Contracts. The manuals explain, paragraph-by-paragraph each of the AIR CRE Contracts and related addenda to serve as a reference guide for readers. 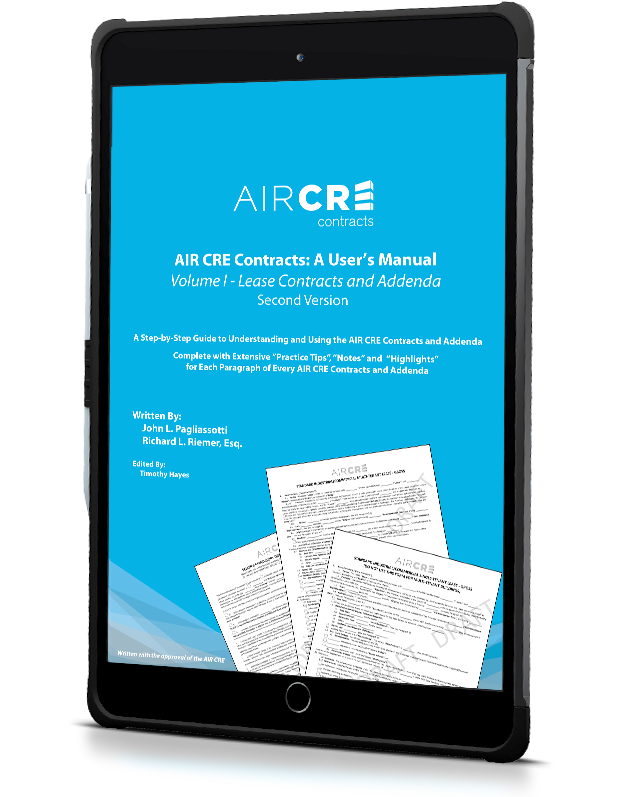 These manuals provide a step-by-step guide to understanding and using the AIR CRE’s Contracts. Both volumes are written by the experts who create, review, update and provide training for all of the AIR CRE Contracts. "Highlights" - summarize the lengthier paragraphs in everyday language. "Notes" - explain the concepts of the more complex language. "Practice Tips" - provides real-world, deal-specific practical tips for landlords, tenants and broker. If you use the AIR CRE Contracts or represent clients who do, the AIR CRE Contracts Manuals, Volume I and II are a must! Copyright @ 2019 AIR CRE Contracts all right reserved.